Father Christmas or Santa Claus? Many people use the names as if they both referred to the same character, but in fact the two are quite different. Santa Claus is based on the Dutch Sinterklaas and the German Sankt Niklaus characters. Father Christmas is descended from pagan mythology. We know very little about the customs used the Celts to celebrate the winter solstice. They seem, however to have included a figure wearing a long, green, hooded cloak and a wreath of ivy, holly, or mistletoe. Here, long before the birth of Christ, is the character who would develop into Father Christmas. When the Saxons invaded Britain, they brought their own solstice tradition with them. In each village, an elderly man would dress up in furs and become 'Old Winter'. People believed that he carried the spirit of winter with him and the season would be kind to any household that had been hospitable to Old Winter. He would go from house to house, enjoying gifts of food and drink. When the Saxons converted to Christianity, they did not give up Old Winter. The custom was observed through the Middle Ages. Eventually, Old Winter became a character in Christmas mummer's plays. The Vikings brought along their beliefs when they settled in the north of Britain. They believed that Odin, in the form of his December character, a portly, elderly man with a white beard rode through the world on his eight-legged horse Sleipnir at solstice. Dressed in a long, blue, hooded cloak, he sat with his people and listened to see if they were contented. He also carried a satchel of riches, which he distributed to the worthy or the poor. After 1066, the Normans added their veneration of St. Nicholas to the mix. Nicholas was Bishop of Myra, in the area that is now Turkey, in the 3rd century AD. He was generous to the poor and particularly kind to children. St. Nicholas became very popular in Britain. By 1500, over 500 songs and hymns had been written in his honor and over 700 churches were dedicated to him. He also began to be blended with the character of Old Winter. Our first written reference is a line in a 15th century carol: "Welcome, my lord Christmas." Sir Christmas or Captain Christmas often presided over holiday entertainment in large houses during Tudor and Stuart times. An illustration by Thomas Nabbes, made in 1638, shows him as an old man in a long furred coat and cap. In 1644, the Puritans banned Christmas celebrations, and Father Christmas as well. People missed the revelry, and the figure of Father Christmas was often used to express their dissatisfaction. It was about this time that he became part of the mummer's plays. Often, he strode onto the stage at the beginning of the performance, calling to the audience, "In comes I, old Father Christmas, be I welcome or be I not? I hope old Father Christmas, will never be forgot." In 1645, a London broadsheet taunted the government with the story about the conviction and imprisonment of Father Christmas, and "the Hue and Cry after his escape therefrom." In 1678, a book titled The Examination and Tryal of old Father Christmas and his clearing by Jury was published in London. When the monarchy was restored, so was Father Christmas. The Victorian Father Christmas included characteristics of all these figures. He was usually drawn as an old man in a long, hooded coat. The coat was usually green, but it could be a variety of colors -- blue, turquoise, purple, green, and brown -- and could be trimmed with furs or decorated with stars. John Leech drew the illustrations in the first publication of Dicken's A Christmas Carol. The Ghost of Christmas Carol wears a long green cloak and a holly wreath. Father Christmas's coat was usually red after about 1880. 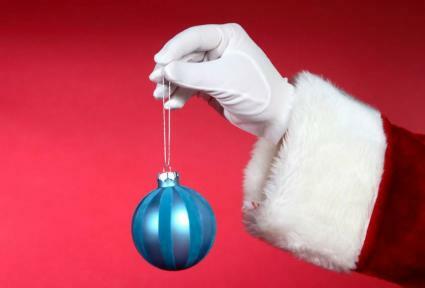 The color was probably influenced by the popular choice of red for the American Santa Claus. In the United Kingdom, Ireland, and many Commonwealth countries, children still write letters to Father Christmas to tell him what presents they want. Some mail or email their letters. Others follow the traditional practice of throwing their letters into the back of the fireplace, where they will be swept up the chimney for "delivery" with the sparks.